I took the shot this September at Naperville Hummer, my dealer in Illinois. The owner was towing a very large trailer down the highway like one of those Wells Cargo jobs. He got caught in a cross wind which started the trailer and truck to oscillate. When he came up over a rise the wind really hit him and caused the truck to go out of control. The hitch sheared off as the trailer jack knifed forcing the Hummer off the road. The Hummer went careening through the ditch flipped a few times and finally came to rest. The story goes that there were 4 people in the truck and nobody got hurt. The truck was totaled by the insurance company because the damage estimate was over 50k. 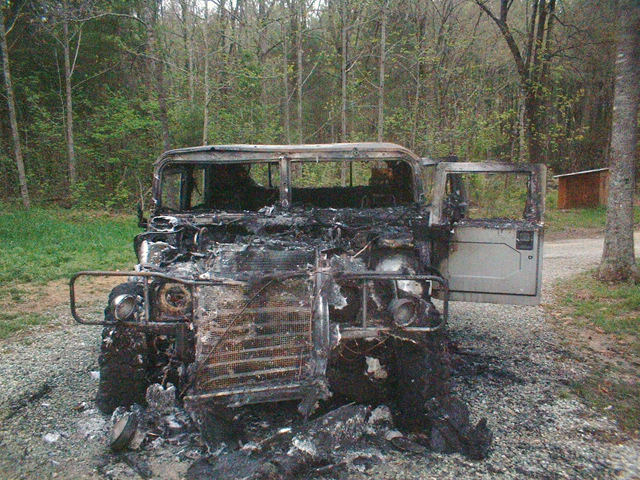 The truck was carted off to auction soon after. I tried to find out where it went but had no luck. The fella that owned the truck just bought a new turbo-diesel. Caddy = totaled - Driver mangled? A Mil friend told me that a M1 ran into the back of a HumVee (30 miles per hour), the rear (left) bumper brackets sheared the bolts off, and minor body damage. Same chap said that the real angles for the 4 door soft top was 54 degrees sideways and 72 up a hill (backwards). On the Eastern Shore of Maryland last summer a Hummer and an older overland commercial bus met. The bus either flipped on its side or was badly damaged and wound up in a field. The Hummer motored to the side of the road and stopped. It was bent but not broken. I thought that the list might get a kick out of my adventure. I was upstairs standing near a front window. I heard my neighbor start yelling "oh no, oh no, oh no" I looked out to see his Crown Victoria rolling down the driveway, with him chasing after it. It was kind of funny, until I realized that it was heading for my Hummer! I watched in horror as the car slammed into my Hummers' bumper. The car had rolled for about 150 feet before hitting the truck, it had built up quite a head of steam. I ran downstairs to see the damage. 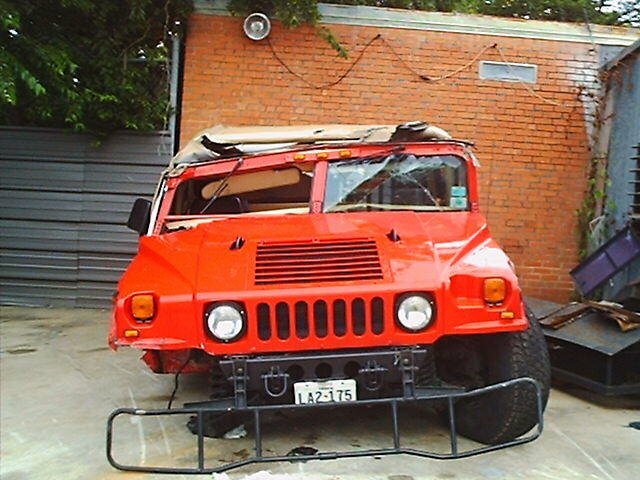 To my amazement, there was no damage to the Hummer. Just a small scuff on the bumper and some of his paint. His car is another story, the right rear is really torn up, as is the tail light, the bumper cover etc. 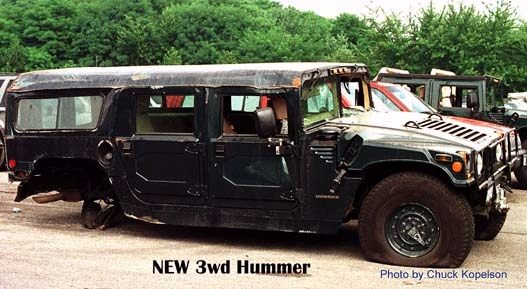 Once again, a Hummer has proven itself to be the ultimate suburban assault vehicle. I was parked at a light on Richmond Ave, Houston, TX, when a Nissan Sentra rear ended me in my 93 4dr ht. The Nissan was travelling approx 30 MPH, and made no attempt to slow down. The Nissan was obviously totalled and had to be towed away. It's driver couldn't speak english, so I never got an answer as to what he was thinking before attempting his Kamakaze career. An HPD unit and tow truck arrived and both pointed to our vehicles and started laughing. 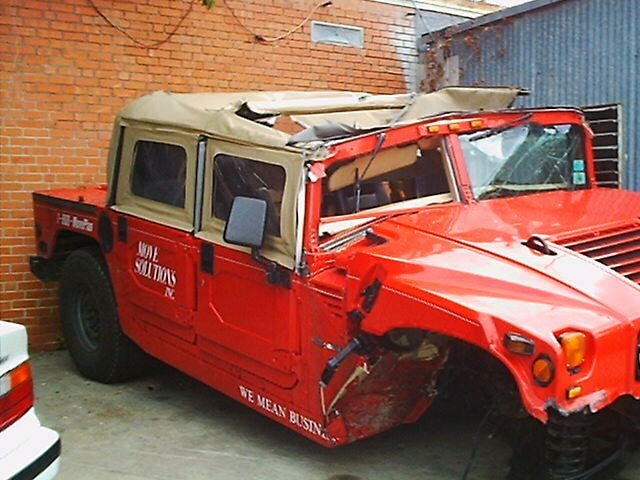 No damage to the hummer...I mean nothing. About one week later I noticed rust where some paint was chipped away on the bottom of the bumper. A quick sanding, black spray paint and she was good as new. 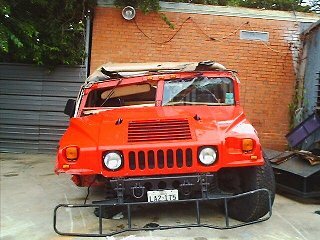 This event ensured that my second (current) Hummer (95 open top) came with the ever valuable heavy duty bumper option. 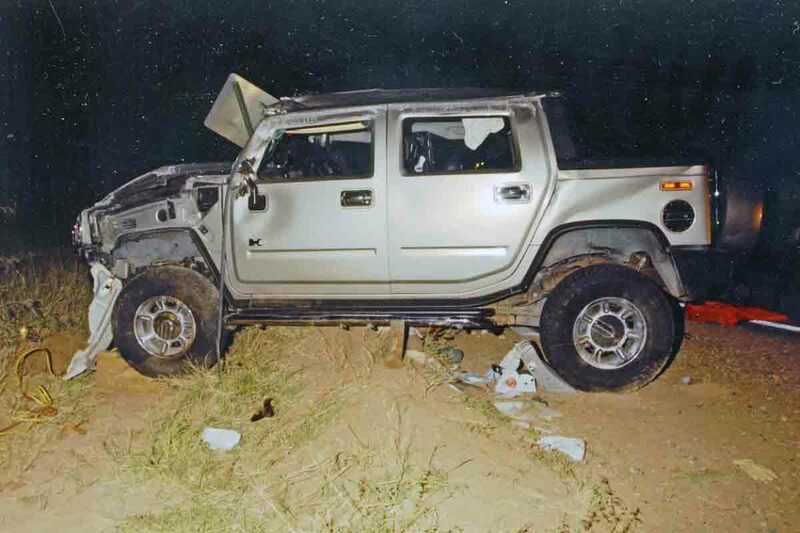 Moral of the story, never drive a Nissan to a Hummer fight. On the other hand, two weeks ago, while backing out of my driveway, I hit my own car, a red Baretta, on the driver's side door. It ripped most of the door apart, and bent the post. A friend of mine fixed it for $825, and said it was about $1400 in damage. The super strong hardened steel back bumper is a dangerous weapon. This happens alot, I've been hit twice (once by an unmanned BMW, once a Mercedes). The BMW rolled down hill thru a parking lot (someone was trying to steal it). The Beamer nosed into and under the end of my airlift bumper and put an inch long mar in the paint ($6000.00 damage to the BMW). The Mercedes rear ended me (and took the pintle hook in the right head light, which got shoved up a third of the way into the hood, OUCH! I think this was about $10,000.00 damage to the Mercedes), and busted my license plate light ($11.00, but I made them pay for powder coating my bumper... My neck is another story). The story: For years I've used Move Solutions to do our internal moves and I utilized their facilities for off-site storage. One of their company cars happens to be a Hummer that they basically use to cart customers around in to go to dinner or social, sporting events, etc. They have three locations in Texas and one of their salesmen had it down in Austin. He said it just kinda slipped out from under him when he took the exit ramp off of hi-way 35. He was only doing 35 MPH???? 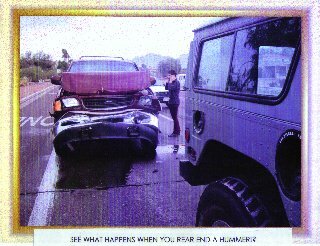 On September 7th, 2002, my wife and two children packed into my AMG Hummer Wagon with me for a trip to CanyonLands in Moab Utah. This was supposed to be a end-of-summer trip to show my wife some of the most spectacular scenery that I�ve ever seen. When I did this trip during 2001 with my business partner, Clark, I was floored with the spectacular scenery and this after having been jaded to some degree by seeing lots incredibly spectacular scenery throughout the rest of the country. This was also a nice time for me to take my family on an outing before the national Hummer Club�s get together in Moab two weeks later that I had spent quite some time getting my vehicle ready for. This is where the top people in the country get together with their Hummers and take them on trails that would make the average person and even experienced off road driver gasp with disbelief at what the Hummer can climb, descend, and do. The trip to Moab was uneventful other than having numerous delays along the way. When we arrived at CanyonLands, it was about 4:30 p.m. while the original plan was to get into the canyon by 10:00 a.m. When picking up our permit from the ranger, the ranger explained to the patron ahead that he needn�t worry about flash floods because they don�t have narrow canyons like in some parts of Utah where people get trapped and drown on a frequent basis. This, I learned later is not quite accurate. The trip began with a ten-mile drive to the canyon on Mineral Bottom Road during which we had a slight shower. By the time we reached the canyon, the slight shower had reduced to a drizzle. From the edge of the canyon, we descended over 1,000 feet upon a series of switchbacks along the canyon�s wall until we received the bottom where the Green River flowed. The road along the bottom again was in good condition and had occasional puddles which I powered through at high speed making lots of spray and my three year old son Aaron exclaim �Fun! Fun!� My wife, Mihoko was already impressed with the scenery and the beauty around us. I was pleased because we hadn�t even gotten to the most spectacular areas of the park or even areas that were moderately spectacular. I knew she must be in for a real treat. We drove along the river for about 10-15 miles really enjoying the scenery and having our family together. We passed a campsite on our right. We were going to be staying at the �Potato� campsite, which means we had only three more to campsites go. We also saw kayaker�s who were camping along the side of the Green River. Not long after passing the campsite, we descended down towards river level. Here the road split. However, it was all very confusing since the road basically was in a river wash at that point and it was hard telling where the road was. We started to take the right hand fork but after going 50 yards up the road we saw the road going off to the left. I got out of the vehicle to investigate and after finding it was a real road (there were tire tracks) I backed up and took the left fork. This was a near fatal mistake. We proceeded up the left fork and had only gone up perhaps 100-200 yards before Mihoko said, �What is that?� And sure enough something up ahead was looking kind of strange. We saw about 2-3 inches of water coming at us. However it wasn�t an angled tapered flow but a boiling and rolling flow of reddish brown water. I realized that it was a flash flood and tried to pull up and over the bank on the side of the road. However, the embankment was all sand and nearly vertical and so there was nothing solid for the tires to grab on to and traction was non-existent. The water when it hit the vehicle immediately started to swirl around the vehicle and tires. The weight of the Hummer (7,500 lbs) kept it in place while I continued to try to get out of the way. Fifteen seconds later however, we were hit by a wall of water that was one half way up thee doors and after that it was not long before we floated free. At that point, we started to say some major prayers out loud while we continued to try to get the Hummer onto higher ground. Occasionally we could get a bit of traction on the bottom but it was nowhere what we needed to get out of the rising water. It was not long before the water was part way up the windows. We would role the windows up and down to see what was going on while keeping the water out. I shut off the engine to keep the water from being sucked in and breaking a rod or something worse. To the Hummer�s credit even while floating down the river everything kept functioning. Electric windows, warning lights, air compressor for the tires, and these played a big role in our eventual survival because we knew exactly what was going on and could take the appropriate measures to ride things out. The Hummer�s warning lights always kept us well apprised as to what was happening where. Many kudos to AMG for their warning light system. The Hummer as you can imagine was really taking on a beating by the rocky ground underneath and by the sides of the wash which we were being slammed against. 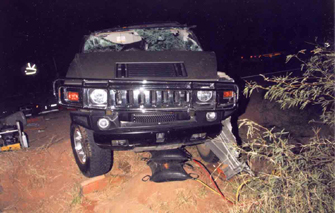 You could hear the impact of large rocks hitting the Hummer with resonating booms and the gravel and other things on the bottom of the wash grating against the bottom of the Hummer with a loud grinding noise. 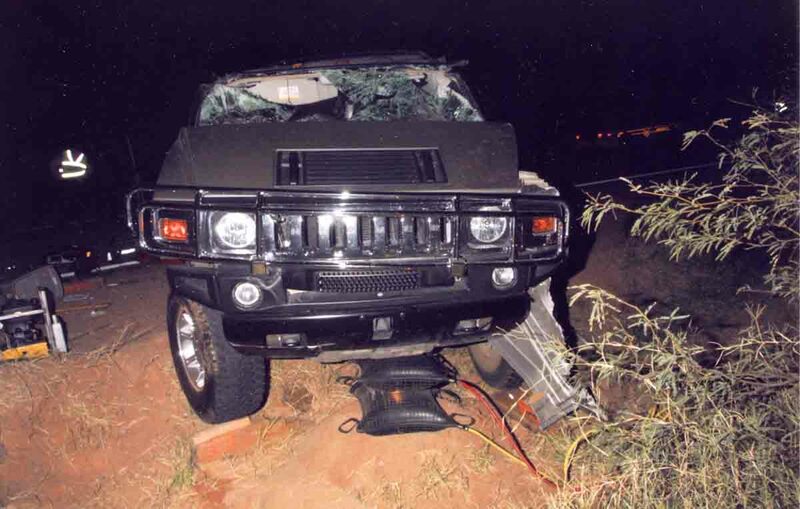 However, the Hummer remained upright and the doors sealed even though the water level was covering most of the vehicle and even most of the hood. Many times we were floating free and the Hummer was taking the huge waves with ease and did not show any signs of instability or desire to tip which would have been disastrous. In fact, I don�t remember seeing any leak around the doors or other seals during the ordeal except for a negligible bit of water that came up through the gearshift in spurts. All the while, as you can imagine, Mihoko was not well pleased. In fact, she was quite displeased. However, considering the circumstances I can�t blame her. I told her to undo Ian (our five month old) from his car seat and give him to me and that she did. Then I had her undo Aaron (our three year old)�s seat belt and I told him to crawl to me. It was amazing. Despite the fact that the Hummer was bucking and rolling and turning every which way, Aaron hung on to whatever was near by and slowly made his way over to me. This is really to his credit. He was incredibly brave not even crying or complaining or hiding in the corner as some children might. I was deadly serious when I told him to come to me and he was in doing what he was told to do. This saved his life and I hope it provides a learning experience for him in the future. All this time, I had also been telling Mihoko to get out of the truck and to swim for it. She said �What? And get killed?� I told her that she would get killed if she stayed. So, I gave her a quick rundown on how to swim in rapids by keeping your feet pointed down river and use them to push off from anything that you hit too hard. She eventually climbed out the window and stood on the windowsill while holding on to the roof rack. What had finally convinced her to get out was that the water level was getting even higher (or perhaps we were starting to float lower) and water was beginning to splash into the vehicle even though the windows were rolled up almost to the top. What had convinced me that it was time to go was that one of our tires was floating down the river right next to us. Of course, this meant that even if we ended up on high ground and the engine was capable of restarting there was no possibility that we were going to be able to get out of the river. Once she was clear, I grabbed the important papers I had in the glove compartment including phone numbers of people in the area that might be able to assist once everything was over and the cash that was on the dash. I grabbed Ian in my left arm and Aaron in my right. Mihoko had jumped when the car was facing upstream and it was at this point, I started to try to force the door open. The door did not want to open and I remember thinking that it would be real scary and a bad situation to have to wait until the water level was high enough that the water pressure would begin to equalize. After three or four tries, I finally managed to force the door open and jump into the maelstrom. Needless to say, I didn�t see what happened to the Hummer after that. I just hoped that I was clear. I looked down at Ian and Aaron and their faces were all covered with red mud and small sticks and other debris. Ian�s eyes were closed and he was deathly still. I couldn�t help but wonder if he were already dead and if I were holding dead children. In either case, I held on and hoped for the best. I tried to swim to shore but the shore was elusive and swimming in jeans and running shoes does not work well anyway. So the best I could do is to try to keep my feet pointed downstream. I saw Mihoko get out of the water all covered with mud and give a blood-curdling cry �Art!� and as she related later she said she felt like she was watching herself lose her family right then and there. My feet touched the sand not too much further and I pushed hard to get to shore but the currents quickly swept me onward. Again my feet touched bottom and I gave several huge heaves as my feet skidded across the bottom and somehow that did it and it pushed all three of us up to shore. I threw Ian and Aaron several feet above the water level while I collapsed with all but my head upper torso in the water. As luck would have it, we were on the same side of the river as Mihoko. (She would have had my head if I had ended up on the other side of the river.) Mihoko came running up screaming for the kids and wanting to know if they were ok. Ian looked like he was dead and Aaron was just starting to move around some. Mihoko helped pull me from the water which was good because I am not sure if I had the strength at that point to do it myself. Once upon dry ground, I started to gain my composure and realized we needed to act quickly to ensure we came through it with minimal problems. I removed Aaron�s shirt as well as my own so as to give him the warmth he needed. Ian�s shirt came next he was beginning to turn purple. Aaron was concerned that he had lost his shoe and kept saying �Shoe, shoe, shoe�.� I reassured him that it was all right and we could get another shoe later. Mihoko carried Ian and I carried Aaron while we proceeded along the wall of the canyon downstream because that is where we last saw people. Ahead, we saw some large rocks behind which I had Mihoko, Aaron and Ian hide from the wind. Furthermore, I had Mihoko take off her shirt to warm the children while I assessed the situation. Not far from where we were, I found a rock outcropping where the river at a much higher period had carved away the soft rock underneath a slab of harder rock. Not only did this seem like a natural shelter but because of the way it was situated it was naturally out of the wind. It was going to be getting dark soon and so the immediate issue was to get everybody in a shelter before night set in in � hour or forty five minutes. I gathered tumbleweeds that had blown in and around the natural shelter and built windbreaks on the sides. As you can imagine, tumbleweeds do not make the best windbreaks but when that is all that one has to work with they are a welcome material. Once the shelter was ready, I went back for my family. The shelter was much warmer than the rocks they had just left. I spent the time left before it got dark gathering more material to reinforce the walls of the shelter and make whatever additional windbreak I could. The torrent of water was beginning to drop and the wheels of the Hummer were slowly becoming visible through the standing wave of water where it had come to rest just upstream of where we were. The Hummer was resting on its roof with its tires barely sticking out of the water. I imagine that it was when I forced the door open and let in a torrent of water into the vehicle that that is what upset it and made it only a matter of time before it sank or overturned. The sound of the rushing water however did not diminish for quite some time. Even though we were now about 100 yards or more away from the rushing waters it still sounded like a freight train was coming through with a roar. I scouted occasionally as it became dark to try to find a way across the wash but each time I thought I had found a way across I was disappointed. We huddled in the shelter as it got dark. Luckily by this time Ian had warmed up and instead of being a scary color of purple he was pink and in about as good condition as he could expect. Aaron was much more patient than he needed to be and he fell asleep in Mihoko�s arms. We would shift Aaaron back and forth between us since his weight made him too heavy to hold for long periods of time especially since we were sitting on a rock floor that had pointy protrusions in exactly the spots where we tried to sit. After sitting in the dark for what felt like hours, the sound of the water had died down and it sounded like what you would expect a regular stream to sound like. I felt it was time to leave and try to find some help. I was very concerned as to how cold it would be at six o�clock in the morning. Mihoko didn�t want me to go as she was afraid of what could potentially be waiting out there. Snakes, scorpions, and spiders all terrified Mihoko not to mention the wildlife that could be even more dangerous. On the other hand, the odds of something coming along was fairly slim and the possibilities of our ending up with problems from severe cold in the desert night was quite real especially since we were wet. I never did get a full chance to make a decision as to whether to go or not. I did decide that before I attempted anything I should try giving a holler and see if anybody could here me. I gave a big call for �Help!� and felt quite pleased afterwards. Not only was it louder than expected but the sound echoed nicely against the canyon�s cliffs. With that my hope went up and I had visions of somebody 20 miles off hearing that echo. In fact, it went so well I decided to shout some more. While shouting I tried to think of something more strong than �Help!� since �Help!� sometimes is overused. All sorts of possibilities flooded my mind such as �Mayday!�, �SOS�, etc. however none had the punch of �Help!� and could end up sounding much less convincing than what I wanted so I settled with �Help!� in the end. After a period of hollering, I looked back towards Mihoko. This was partly because Ian was crying and I knew that that wasn�t a good thing as it could attract wildlife and it would not be safe for me to leave until I was sure that Ian was comfortable and not going to cry. Just then, I saw the strangest thing. It looked like fog rolling in over the plane above our rock outcropping. Fog in the desert would be strange indeed and I puzzled over it for a minute until it shifted and I realized it was light from someone�s headlights shining on the mountain above and behind us. I immediately ran up to the top of the hill and onto the flat area between the adjoining mountain and us because the light looked like someone�s car was right there. It was amazingly bright as if the car was sitting only a few hundred feet above where we were. Once on top of the hillside, I saw there was a vehicle on the other side of the canyon. I didn�t know if they were looking for me or simply driving down the road so I hollered some more and eventually they swung a spotlight in my direction. I knew right then we had been saved. I yelled directions Left / Right / Up / Down, until they had the spotlight right on me. Unfortunately, I was too far away so even though the spotlight was on me they still couldn�t see me. Of course, all my clothes were also red just like the surrounding soil. I told them to hold the light where it was while I tried to make my way across to them. I went down to the wash and slowly made my way into the water. It was still moving quickly and was about knee deep. However, with careful foot placement it was crossable. I slowly traversed about 100 yards of ankle deep bog and in not too long the people from the vehicle were coming out to meet me. I explained we had been caught in the flash flood and that I had a wife and two small children who were stranded on the other side of the river and that they were cold and wet. They immediately volunteered to assist and two came across the bog and wash to help me carry them across. They had a hard time seeing Mihoko at first because she was standing by the shelter and the mud on her body and clothes matched the surrounding rock. (In fact, I had a hard time seeing her myself and I knew where to look.) I gave Ian to one of them and set Aaron on my hip leaving Mihoko free to make her way as best she could without the hindrance of having to carry and children. We took it real slowly back to their vehicle so that we wouldn�t drop our precious cargo and so that Mihoko could make her way over with us. (Since it was familiar territory for us now but not for Mihoko.) Upon reaching the car, they immediately started offering us clothes and other things to keep us warm. We rode back with them to their camp and it was a warm and blessed sight indeed. They also offered us Gatorade and other things to drink to help us recover. As soon as they did that I realized how incredibly thirsty I was and not only that but how horse I was from yelling. My throat truly felt like dry cotton. Needless to say, we all drank plenty until we were replenished. We put on the dry clothes they gave us. Aaron didn�t want to wear the shirt they gave him complaining it was �Too big, too big.� After much urging we convinced him to use it like a blanket which was the only thing covering his totally naked body with the exception of his one remaining sandal. Needless to say, they were very sympathetic and did all they could to help us feel comfortable. They let us use their spare tent and gave us an extra sleeping bag and a blue tarp to help keep us warm. We spread out the sleeping bag and used the tarp as a blanket. As luck would have it, it turned out that it was a real warm evening and it remained warm all the way until the next morning so it really was not as bad as it might sound at this point. Besides, we had seen much worse and we knew we were going to all get out with our lives intact. Even so, it was a long night with not as much sleep as we would like. Sometime in the middle of the night, Mihoko asked me what day it was. I thought about it and said I thought it was the Seventh. She then immediately reminded me that the day of our adventure and eventual rescue was also our wedding anniversary. Somehow, we had both forgotten about it until that evening. The next morning we woke and gathered our clothes together and prepared for the drive out. Aaron kept saying: �truck gone� water gone �� and wanting his other shoe. The drive out took about an hour and the road was actually in very good condition for most of the trip. The muddy switchbacks that had challenged us going down the cliff entering the canyon were now simply damp. The ten mile drive from the canyon seemed much longer than the trip in but even so, it was not long before we reached the ranger station. After we had told our story one of the rangers took us back into Moab and we found a little motel (The Rustic Inn) that we could stay at. This ended up being a good choice as they were very flexible with us where a larger more established hotel/motel would have all sorts of policies that they had to abide by. We dropped of Mihoko, Aaron, and Ian and I went with the ranger to go buy some new clothes for Aaron, diapers for Ian, and food for all of us. An hour or two later we returned with all the supplies needed for the next two days. We let Aaron watch all the cartoons he wanted while we slept on and off throughout much of the day. That evening one of the rangers stopped by with what personal effects he was able to recover as well as pieces of the vehicle. The rear wagon door from the Hummer weighed about 200lbs much much heavier than it was originally because it was totally full of sand. Apparently, the whole Hummer was now full of sand and every place where water could seep had a significant amount of sand and silt deposited in it. Because of the weight, the tow truck that had been dispatched to tow out the vehicle had spent all day simply trying to get the Hummer upright. The tow truck also spent much of the day with its front tires off the ground due to the weight of the Hummer (7,500lbs) and the associated sand filling it up. Interestingly enough, the ranger was from the same home town as I (Los Alamos, N.M.) and we knew many of the same people. The next day we waited for my business partner Clark to come and pick us up. Aaron was all ready to go for the day as if nothing had happened the day before and it was hard to keep up with his energy and enthusiasm. The ranger that had come by the night before dropped off a section of the Stinger D-Ring brush guard that had broken off and it is this piece of brush guard that I have as all that is left from the Hummer that saved our lives. In fact, both the roof rack and the brush guard both probably assisted greatly in assisting the vehicle to protect us and to give Mihoko something solid to hold on to while she climbed out of the vehicle. The Rustic Inn let us stay on until 4:00 o�clock when Clark finally arrived. We piled our few belongings into his truck and headed home. On the way out of town, we passed the tow truck with the Hummer coming into town. Needless to say, it was totaled. The roof rack was missing and I don�t remember seeing the brush guard. It may or may not have been there. In either case, the Hummer that had taken such a beating to save our lives was now on its next to last journey. 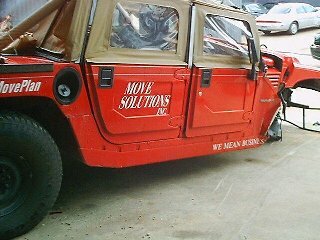 Its last journey being from the tow-yard in Moab to USAA�s junkyard in Salt Lake City. Not long after arriving back in Provo, we put Aaron and Ian to bed and went to bed ourselves. The next day, USAA confirmed that they would cover all but the deductible and that it would not affect our insurance rate since it was not something within our control. The flood we were caught in was considered to be a once in a 50 or 100 year flood. The volume was estimated at over 2200 cubic feet per second and equal in volume to the Colorado River in Cataract Canyon. All told, we had ridden the rapids of this amazing flood for just over three miles through some of the worst rapids and water conditions imaginable. Some of the roads in Canyon Lands National Park were going to be closed for upwards of one month due to the severity of the flood(s) and many sections of road were going to have to be recut. We were lucky that we were able to get out of the water as quickly as we did. The high degree of silt in the water will quickly impregnate your clothes and make them pull you down as if you were wearing clothes made of rock which to some degree you are. In similar floods at least 15% of the total volume of the flood is silt and debris. This can become a severe impediment to swimming. We were lucky too because the amount of silt didn�t go higher than it did as silt levels can be upwards of 30% in some flows. 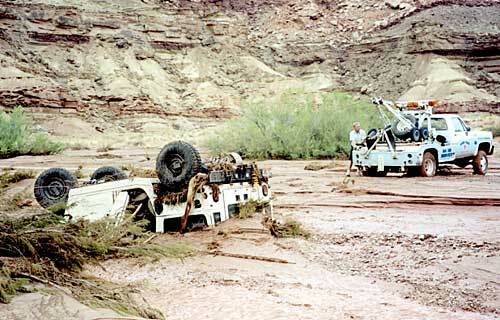 The campers who rescued us were stranded on one side of the flood at at least for the time being were unable to proceed along the White Rim Road as were the other campers. That whole end of the park came to an immediate standstill. The park ranger said that if we were in any other vehicle, they would not be helping us out but would instead be doing body recovery. The various rangers were totally amazed at what the Hummer went through and the damage it received while continuing to protect us. As far as injuries are concerned, across our whole family I was the only one injured with a nick taken out of the side of my left little finger and some good sized scrapes on my shoulder and back. This last was probably caused by when I forced the car door open with my children in my arms. I suspect (though don�t remember) that since my arms were full I used my back and legs to force the door open. Really I don�t remember however the scrapes look like door jam. Finally, it is important to put credit where credit is due. True, we had the ultimate off road vehicle and it was equipped with the best accessories we could buy. However the real credit belongs to our Lord whom we prayed to in our hour of need and who helped save us in the face of insurmountable odds. I am not sure that even with the best equipment one could have survived what we did without help from Above. ... Not having to wait on a tow truck or ambulance after getting hit by a minvan at 40 mph... priceless. 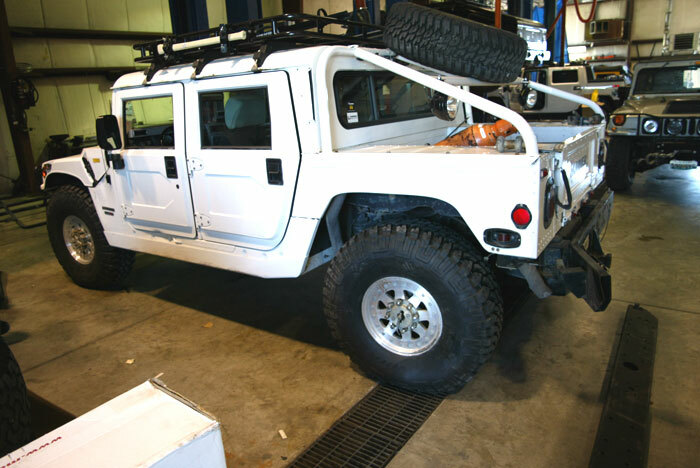 Wrecked Hummers from wreckedexotics.com - Find "Hummer" among the makes listed.